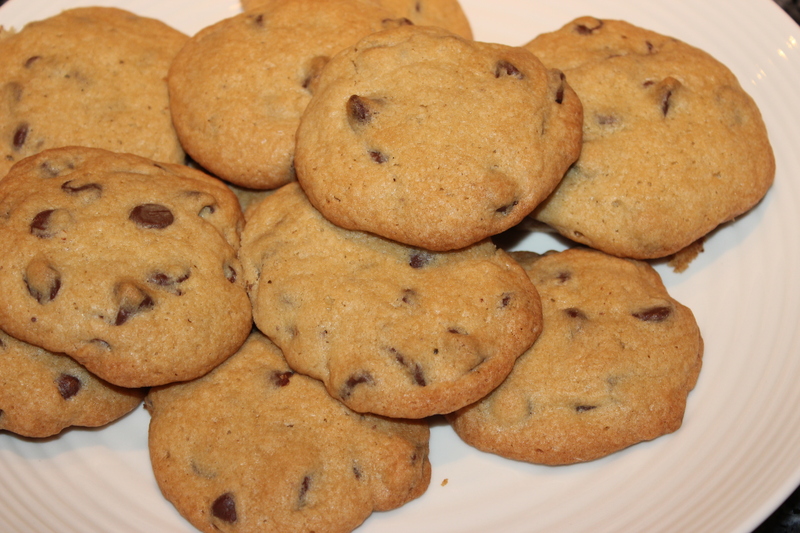 Everyone needs that chocolate chip cookie that reminds them of their childhood. 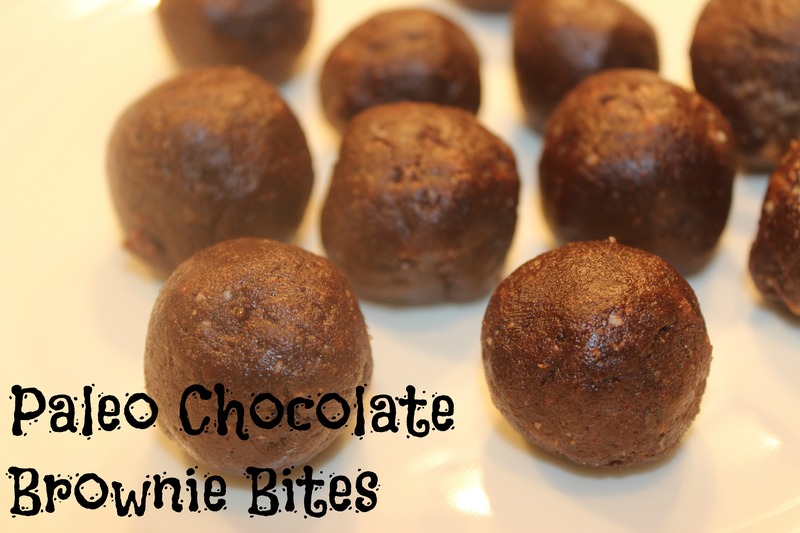 These cookies aren’t unbelievably sweet, they are chewy and filling so you don’t really have to worry about getting your hand stuck in the cookie jar too many times in a day. It’s called…The Kitchen Safe. And it is exactly what you are thinking. 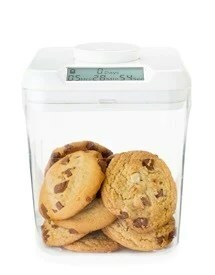 You set a timer on the top of the jar, say 24 hours, and once you open the jar to grab a cookie or two and put it down, the jar will seal itself for 24 hours before allowing your grubby little fingers to grab at another cookie. No doubt, you can outsmart it, but really?! It’s one way to stop the munching. 1. 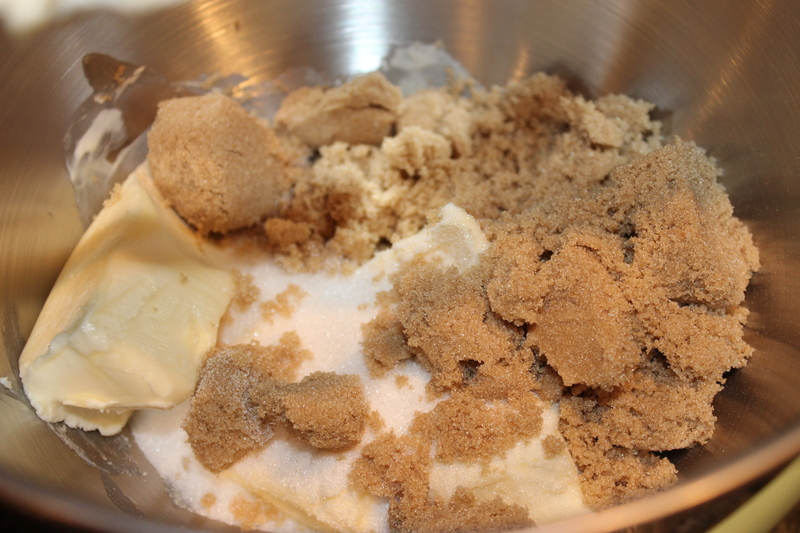 In a mixer, mix the butter, white sugar and brown sugar until smooth. Then add the eggs one at a time, followed by the vanilla. 2. In a small glass, heat up water and dissolve the baking soda. Then add to the mixer and blend. Stir in the salt, flour and chocolate chips next. 3. Place on a ungreased, nonstick cookie sheet and bake at 350 degrees for about 10 minutes, or until the cookies are slightly browned. The cookies will spread, so place them about 2.5 inches apart. 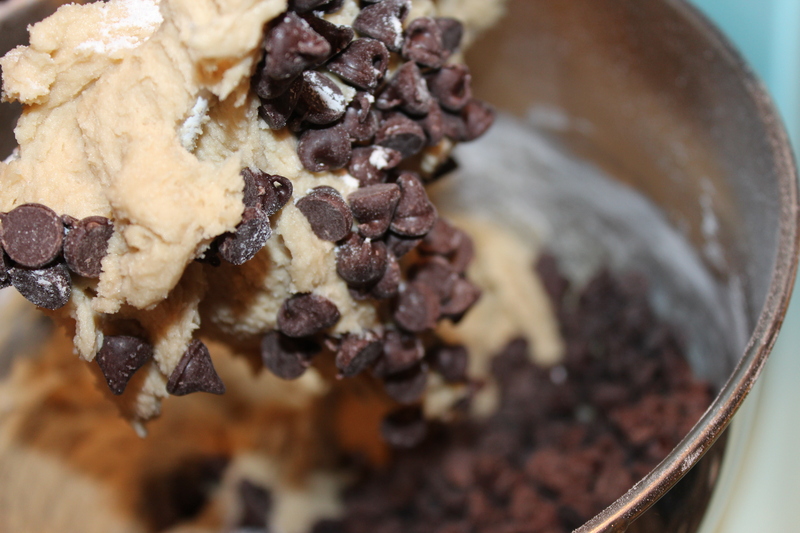 The batter would also be great to mix up the ingredients with, substituting the chocolate chips. What would you lock up in the Kitchen Safe?? This entry was posted in Cookies, Dessert! 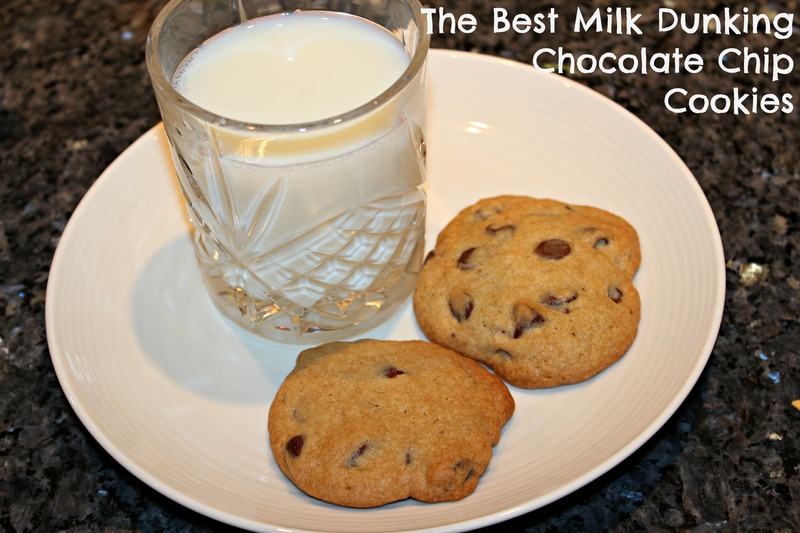 and tagged Basic, Chip, Chocolate, Cookie, Dunk, Easy, Fast, Milk on January 19, 2014 by Sizzle Food. This past week I had a meeting with some coworkers and my urge to bake something led me to bringing a batch of cookies to the meeting. I put these guys out on the table and they were demolished in minutes with people asking me for the recipe. 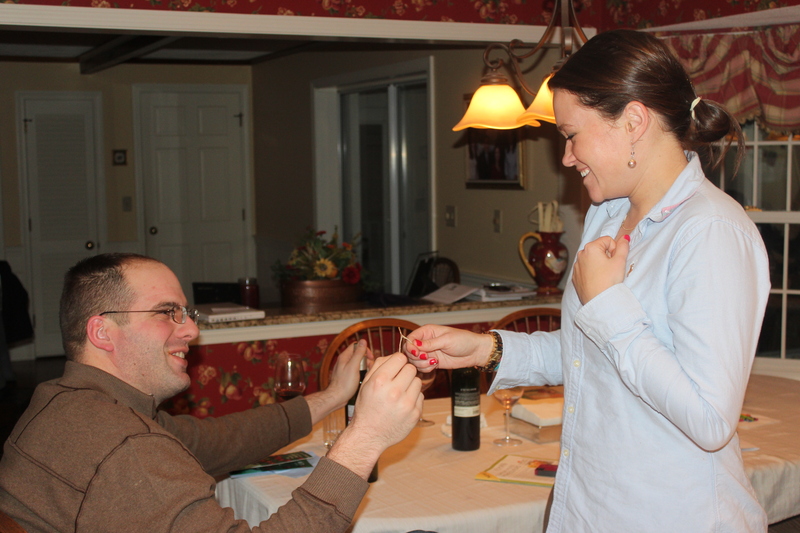 So, I figured I would have to share them with you all, especially since they were requested to be at our next meeting. 1. In a standing mixer, cream the butter and sugar together until it is light and fluffy. 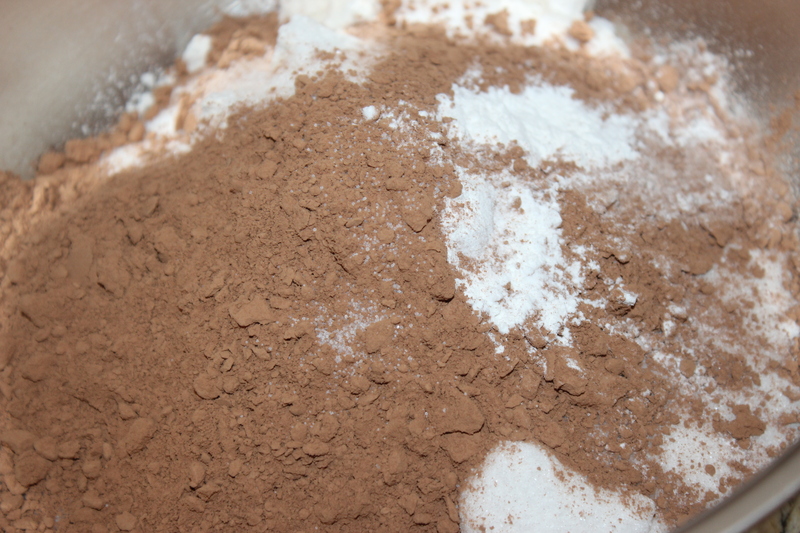 In a separate bowl, mix together the flour, baking powder and salt. Then, in increments of 3, add the flour mixture into the butter mix. Once well mixed, add in the vanilla extract and milk. 2. 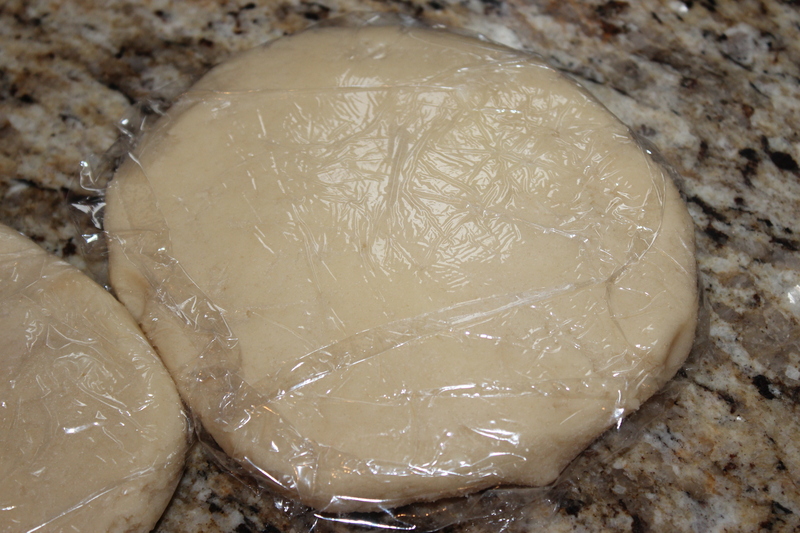 Once mixed, divide the dough into halves, form each shape into a disk and wrap in seran wrap. Refrigerate the dough for an hour. 3. When the dough has chilled, roll one of the disks out onto a lightly floured surface. 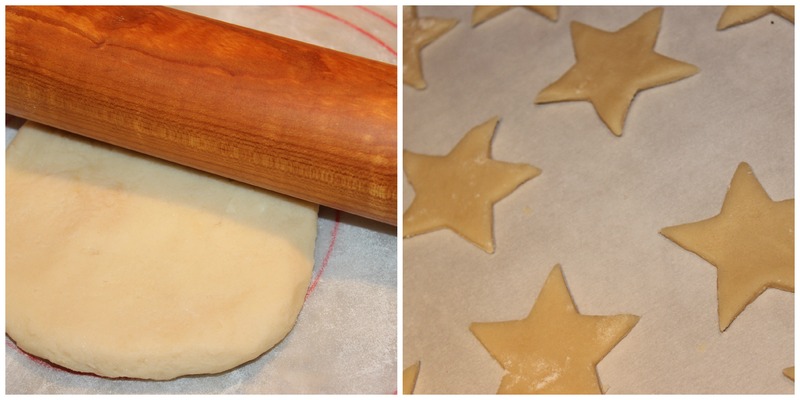 Using a cookie cutter, cut the dough into stars and place them on a cookie sheet lined with parchment paper. Continue until all of the dough is complete. 4. 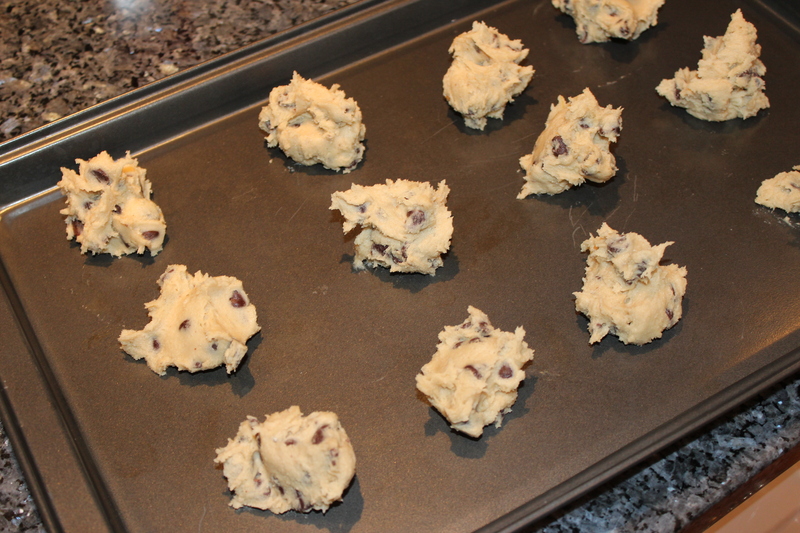 Bake the cookies at 350 degrees for 10 minutes. 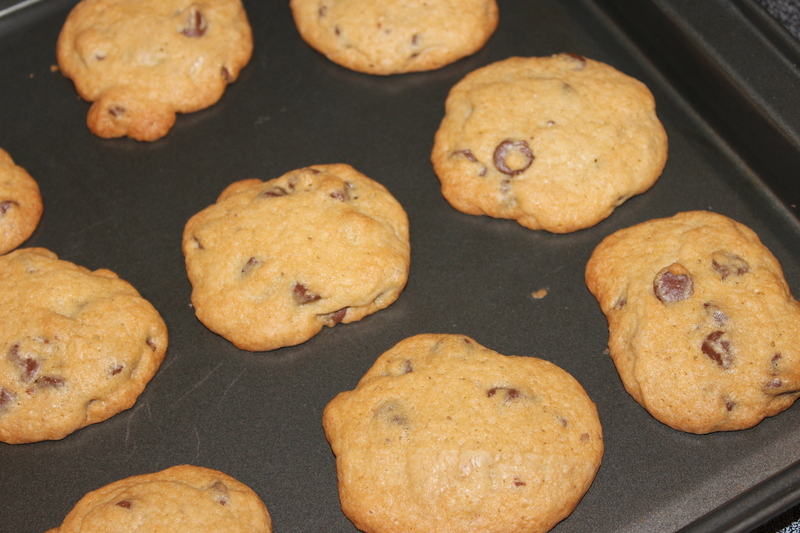 The cookies should come out only slightly browned but cooked through. 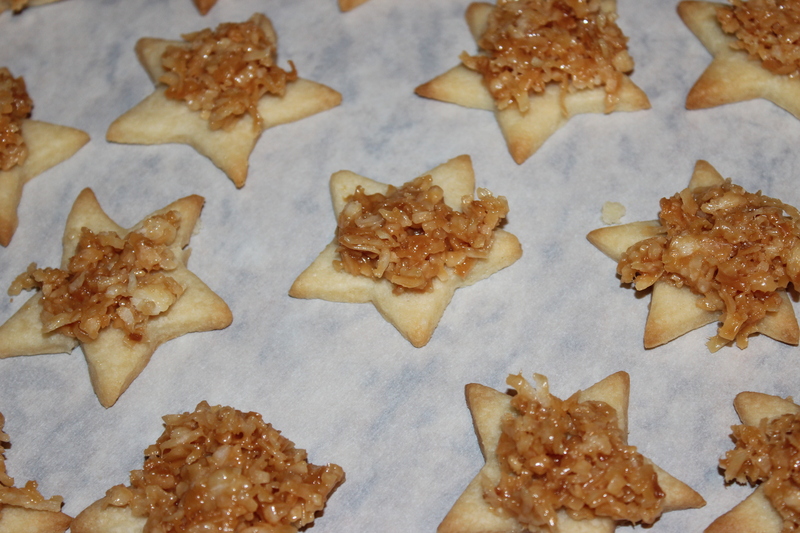 You do not want to cook these cookies too long or else they will break apart when you are putting the caramel topping on them. 1. 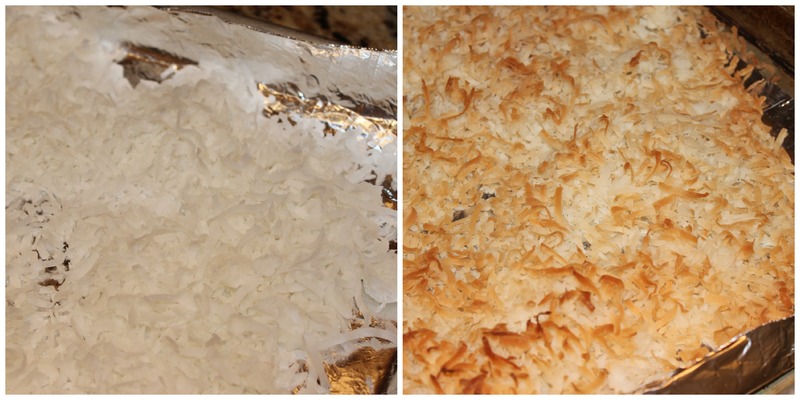 Spread the coconut flakes out on a tin foil lined cookie sheet and bake them for about 10 minutes at 350 degrees. Be sure to stir them frequently to avoid them burning. Coconut does burn easily. Once they are cooked, remove them from the oven and set them aside. 2. 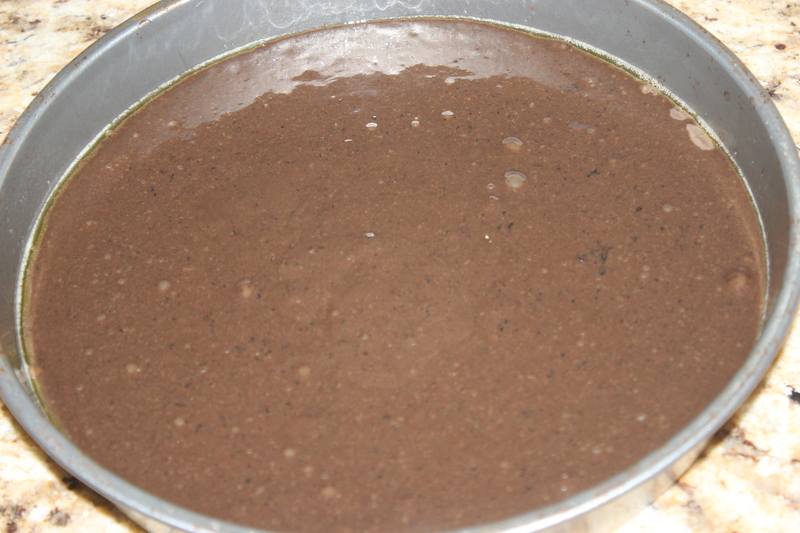 In a double broiler, melt the caramel along with the milk and salt. 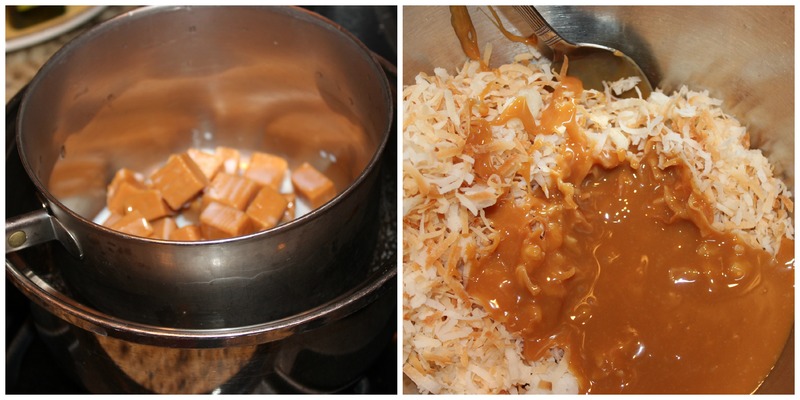 Stir it frequently until all of the caramel has completely melted. Then add 3/4 of the caramel to the toasted coconut. Stir until well mixed. 3. Carefully spread the coconut mixture onto the cooled cookies. I found using a fork worked best. If the caramel becomes hard to work with, try placing it over the heat and melting the caramel a bit more. Patience is key at this step. 4. The hard part is done. 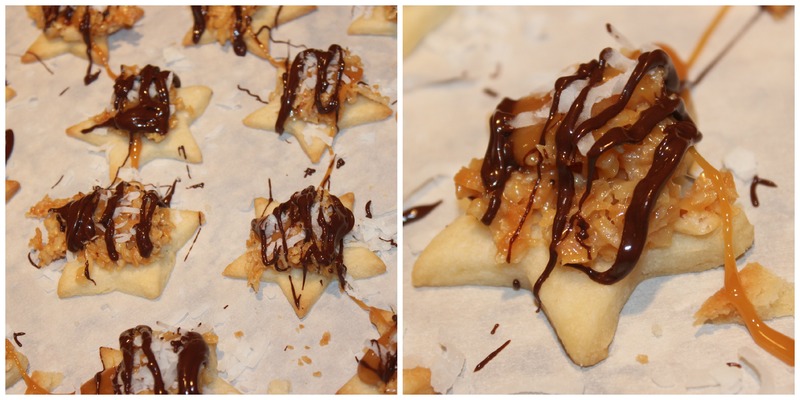 With the remaining caramel, put a dab on the top of each cookie and place a bit of fresh coconut on top. 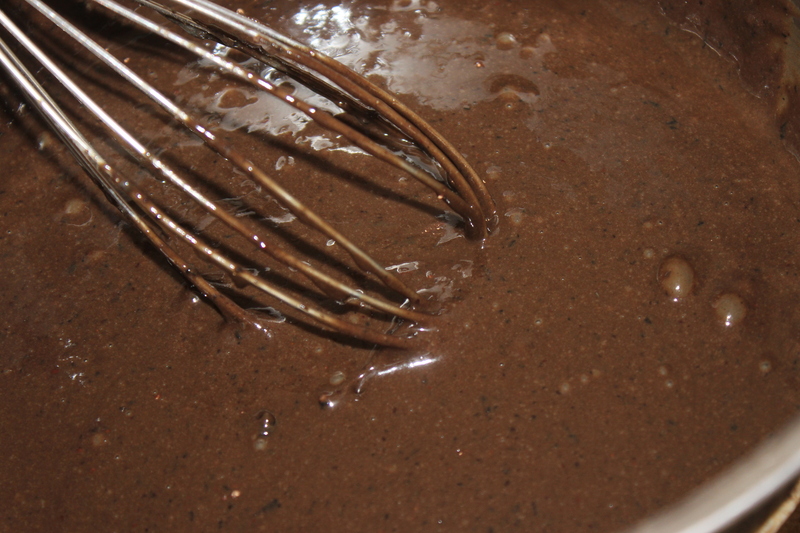 Then melt the dark chocolate in the microwave and drizzle it on top. You should then let the cookies sit out for a bit in order for the caramel and the chocolate to harden. And whelah! I have to say, they really did come out delicious. 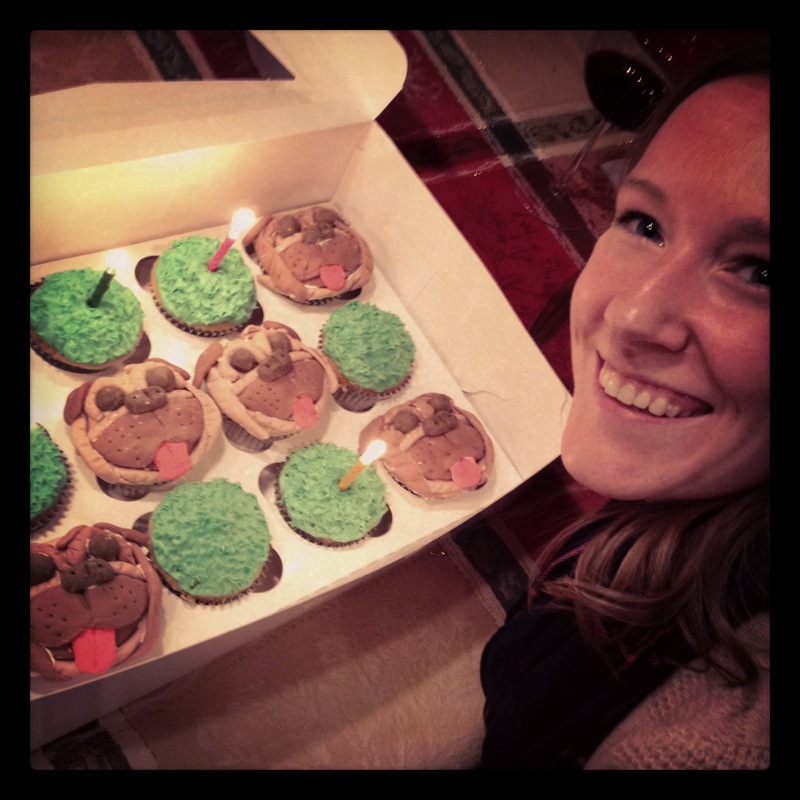 Fortunately, I will be making these again. I have a meeting this Friday to bring them along to and then of course, our next company meeting after the holidays. But I’m definitely going to come up with some other fun options to bring along. Holiday cookies are one of my favorite things to make. Do you have a recipe that takes a lot of effort but is worth it in the end?? 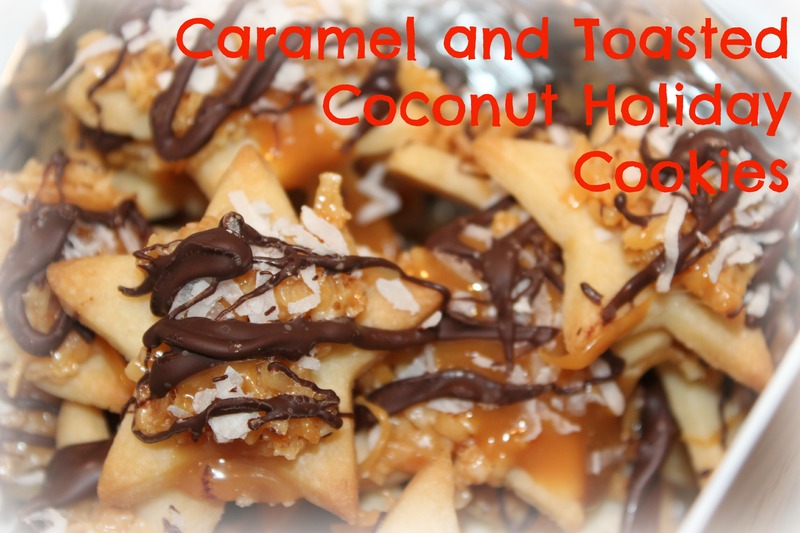 This entry was posted in Cookies, Dessert!, Random, Splurge and tagged Caramel, Chocolate, Christmas, Coconut, Cookies, Holiday, Samoas on December 9, 2013 by Sizzle Food. 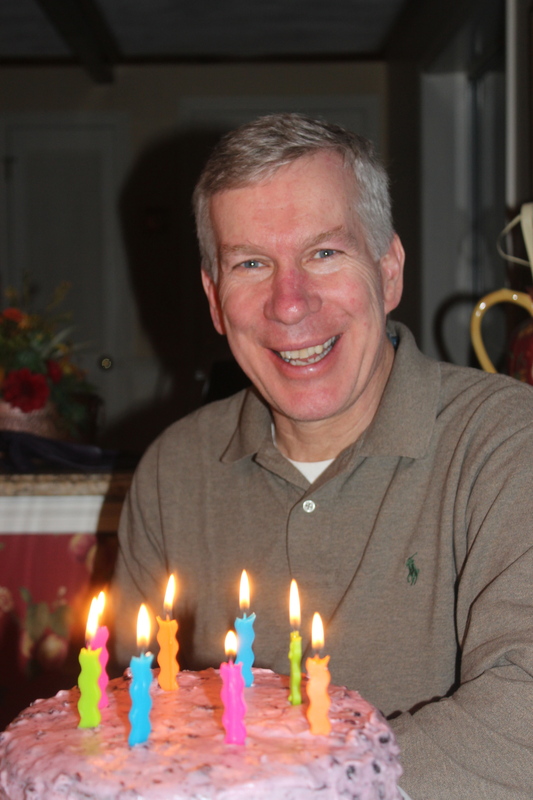 Sunday night was also my Dad’s birthday and birthdays are kind of a big deal in our family. 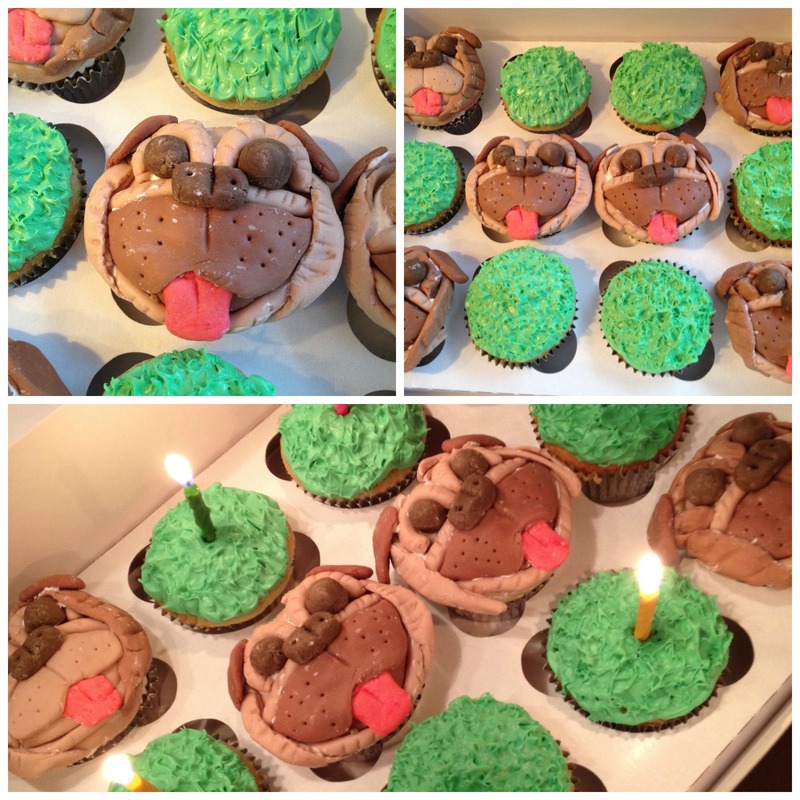 There are a few unique things that I think make a birthday in this house a bit different than what you might see elsewhere. There are usually 7 of us, and now with Brent there are 8. So, it’s loud. Picture the stereotypical Italian family getting together and multiply that by 6 girls. Seriously loud. Dinner is all out. The birthday person gets to pick what they what for dinner and that is what is whipped up. This time was a seafood pasta. When singing Happy Birthday, sing as loud and as out of key as possible. Ear splitting high notes, piercing notes and anything else you can make your voice do. This is usually when the dogs run away in terror. If we have company, they think it’s weird at first then they join in with something we’ve never heard before. We all think it’s hilarious. When picking out a card, it NEEDS to pop up. If it doesn’t pop up, put it down and find another. If you can find one that sings AND pops up, you probably have a winner. There is a competition for the best card and strangely enough, we have never shown up with the same card. Only every once in a while from year to year. Those immediately lose. Sorry. 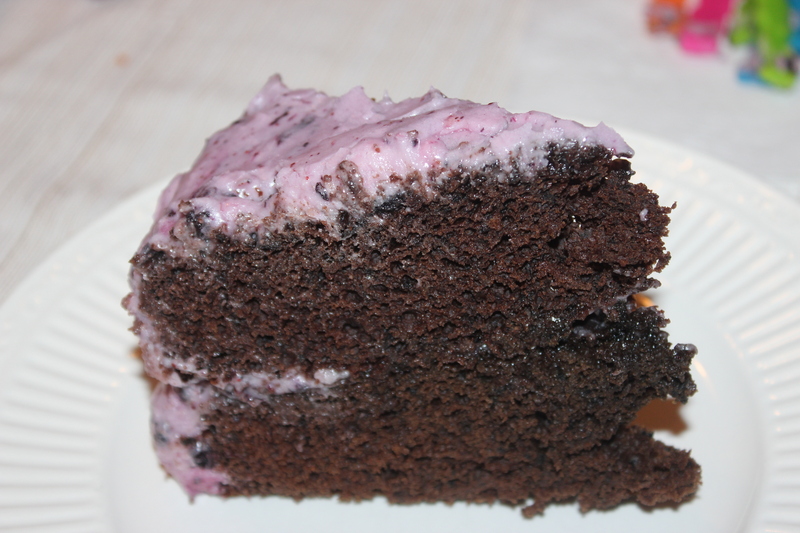 For my Dad’s birthday, I decided that I would make the cake and his favorite thing in the world is blueberry. 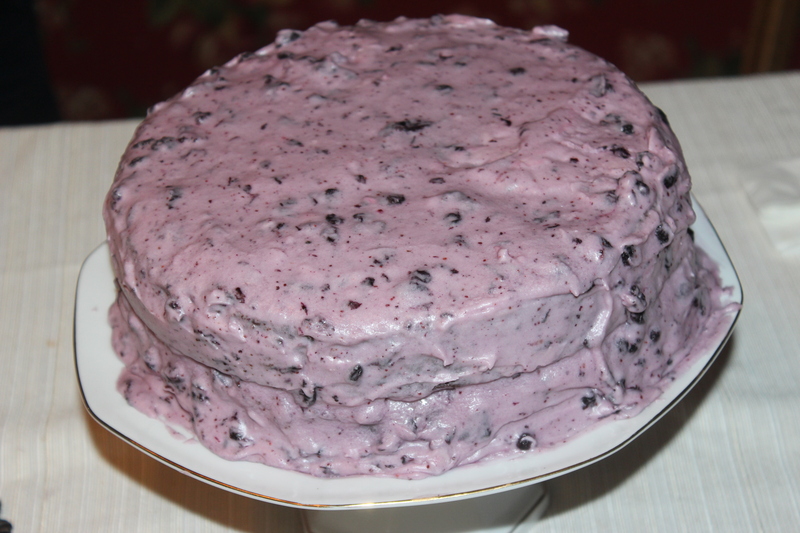 So I decided to make a blueberry cake. Originally it was going to be a Blueberry Lemon Cake, but he didn’t really like that idea. He wanted chocolate. Chocolate it is. 1. In a large bowl, stir the dry ingredients. 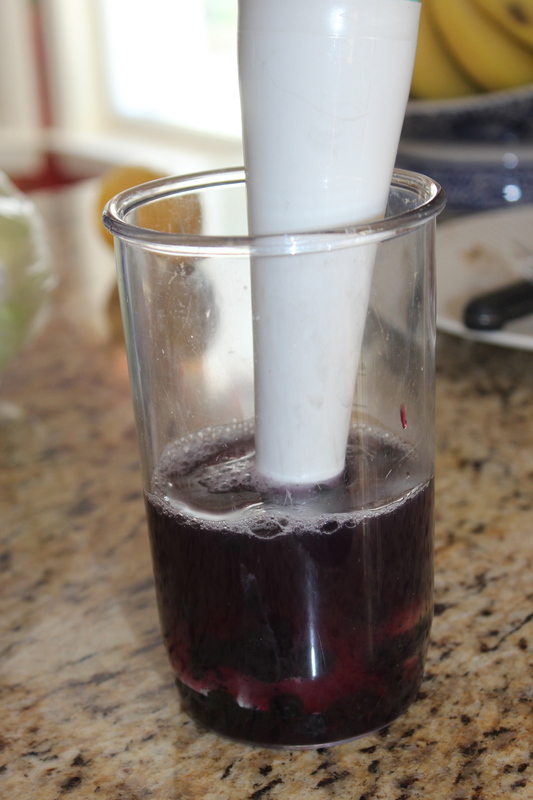 Then, with a blender, blend the blueberries, egg and water. 2. Whisk the wet ingredients in with the dry. Be careful not to over mix the batter. 3. Bake in a greased round 8 inch pan at 350 degrees for 25 minutes. I made two of them in order to stack them for the cake. 1. In a large mixing bowl, beat the butter until it is light and fluffy. Then gradually add in the confectioner’s sugar. 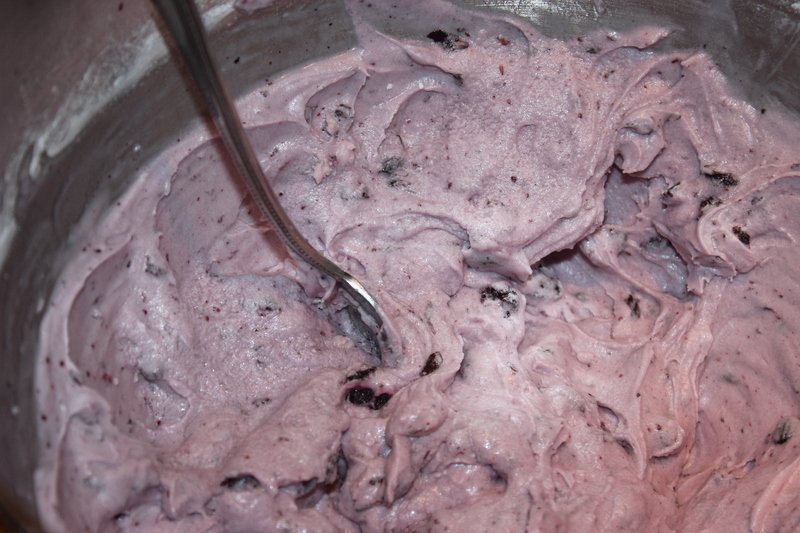 Lastly, mix in the blueberries, and milk. Use the milk to get the consistency that you would like. Easy! When the cake is completely cooled, COMPLETELY cooled. You can start frosting it. 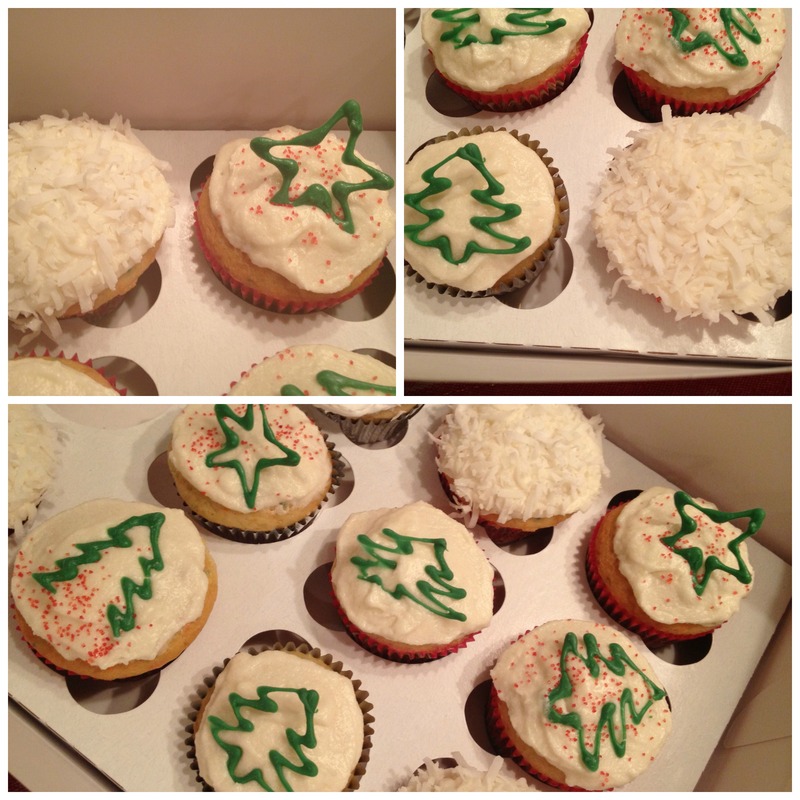 Just know that it needs to be stored in a chilled area because the frosting is made of butter. 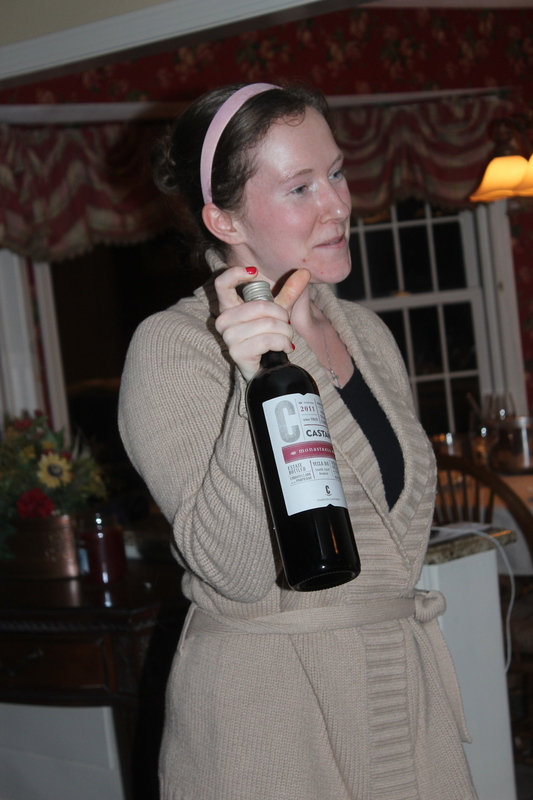 We all sat down for dinner and Maggie gave us a mini wine lesson on the two that she had picked out for dinner. We sat down and had some seafood pasta with a delicious red sauce. 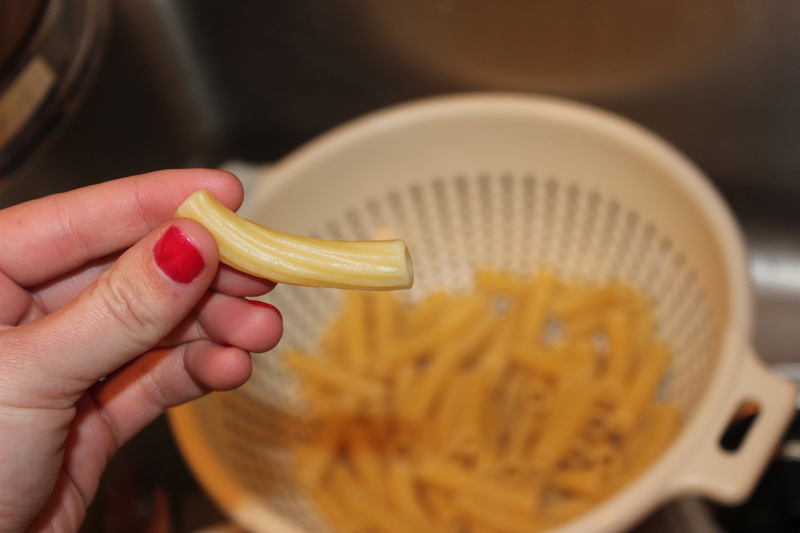 As we were sitting down, I grabbed one of the naked rigatoni still sitting in the strainer just to munch on. 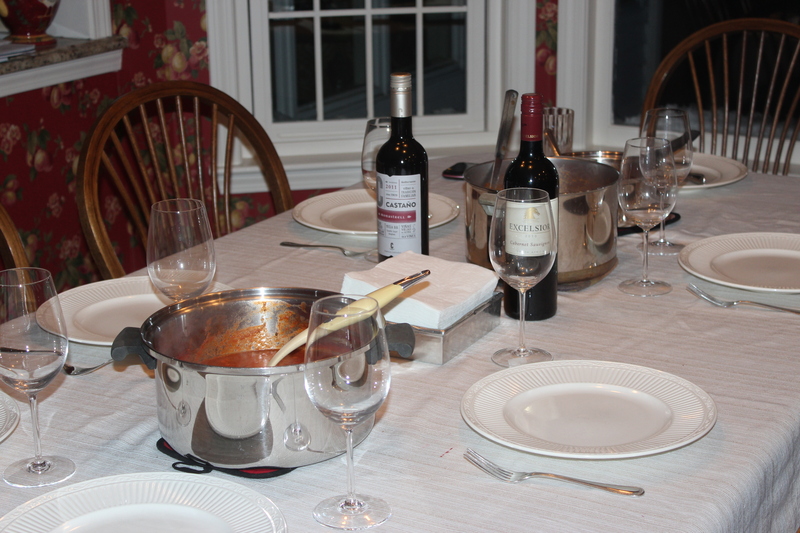 I was talking at the same time, and decided to goof around a little bit, so I blew through the rigatoni…IT WHISTLED! I felt like a five year old that just discovered the best thing ever! Why I never realized this when I was younger, I have no idea. I know I would have driven my mom nuts if I did figure it out earlier. After dinner, the cake came out and I was honestly a bit nervous about how it was going to go over. I have never made one of a birthday cakes and this one was a bit different in itself. I don’t know if you noticed…it has NO OIL. There is no butter, no canola oil, no nothing. The icing obviously has butter but the cake itself. Nada. It’s a healthy chocolate cake. YUP. But it was delicious! The cake itself was really rich. The chocolate flavor really came through in it. 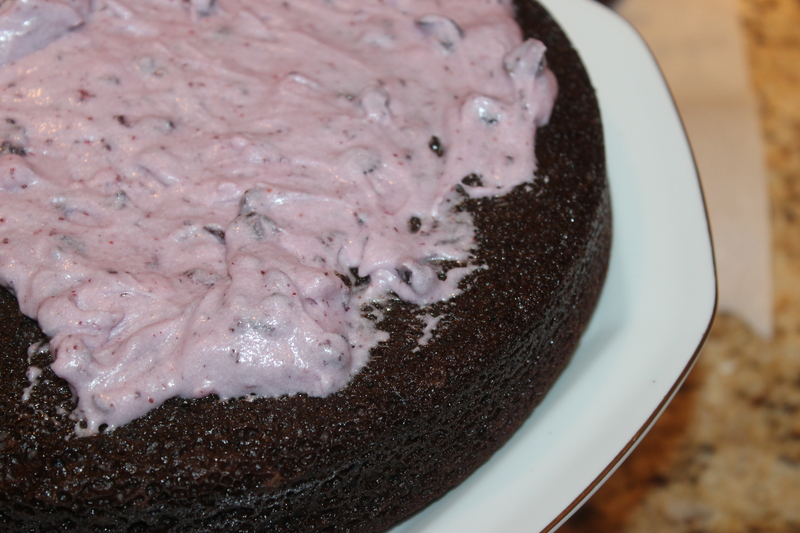 The blueberries were also really apparent in the frosting. Big hit! It was even better the second day. The blueberry flavor came out a lot more the second day. When cake was finished and we were starting to clean up, my dad brought over the wish bone that I had been waiting to dry out for a few days. Brent and I broke it and I guesssssss my wish won’t come true. MER. Do you have any weird traditions in your family?? 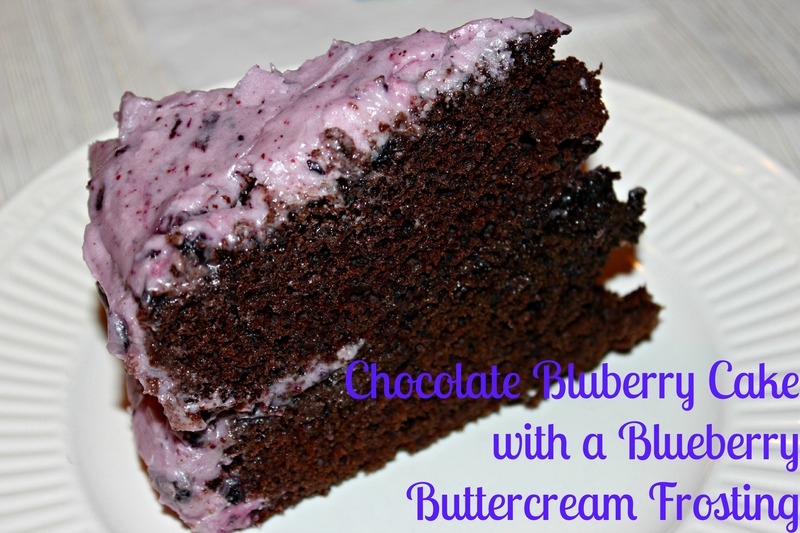 This entry was posted in Dessert!, Splurge and tagged Birthday, Blueberry, blueberry cake, Butter, Cake, Chocolate, Cream, dessert, Easy, Frosting, frozen blueberries, Healthy, Simple on February 12, 2013 by Sizzle Food.